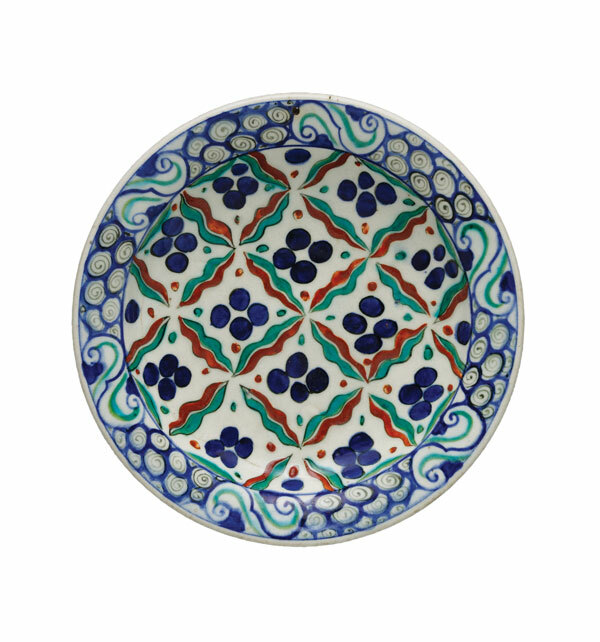 Iznik pottery was an Ottoman Empire favorite. Sultan Suleiman I “the Magnificent” lived up to his name. During his reign, from 1520 to 1566, the ruler of the Ottoman Empire commissioned the construction of hundreds of public structures, most constructed under the direction of master architect Mimar Sinan. Istanbul’s spectacular Süleymaniye Mosque complex might be the sultan’s most splendid legacy, but there was much more built during his rule, including religious buildings, schools, public baths and hospitals. Suleiman also commissioned repairs to significant sites throughout the empire; the extraordinary, elaborate ornamental tile on the Dome of the Rock in Jerusalem being the most stunning example. All of this work kept the artisans of the Ottoman Empire busy, and nowhere was that more true than at the ceramic works of Iznik. By the time Suleiman came on the scene, the potteries of Iznik were flourishing. Like Stoke-on-Trent in England and the towns near the Raritan Bay in New Jersey, Iznik became a pottery center because of the clay deposits and other natural materials in the area. 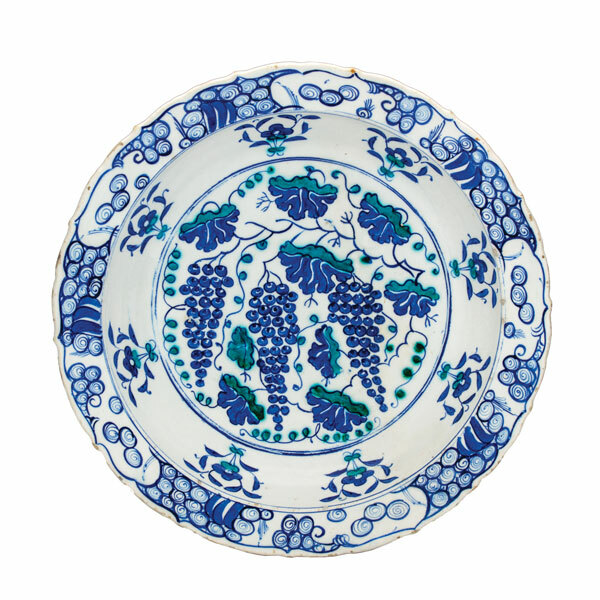 At the time Iznik pottery was gaining prominence, Chinese porcelain was the standard by which other ceramics were measured. Iznik produced a stonepaste (or fritware) ceramic composed mainly of quartz and glass with clay to bind it, which became hard, white and translucent when fired. It wasn’t Chinese porcelain, but it was nearly as fine. Helpfully for collectors, Iznik pottery can be dated by color. The earliest pieces, roughly from 1480 to 1520, are decorated in cobalt blue and white. Toward the late 1520s, turquoise pigment derived from copper oxide was added to the decoration. Mellow olive green and eggplant mauve came along in the 1540s, followed by a bright emerald green and an iron-rich color called red clay red (sometimes called Armenian bole) that created a raised texture where it was applied. The Ottoman sultans were avid collectors of Chinese ware, and that taste influenced the decorative styles the Iznik potters adopted. 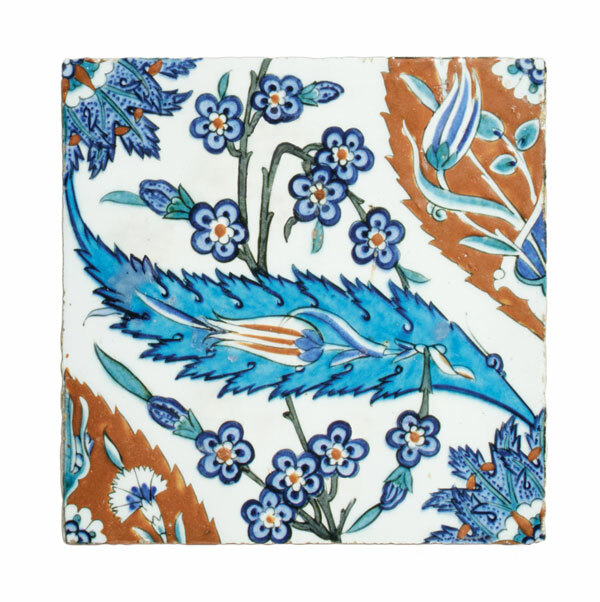 Early cobalt blue-and-white Iznik wares often feature distinctly Chinese motifs, such as lotus flowers and peonies, sometimes blended with Islamic designs and patterns. The more wares that were produced, the more styles evolved, taking inspiration from different sources—including Islamic calligraphy and textiles—to create something new and unique. As more colors were added to the artists’ palettes, designs became more complex. Tulips, carnations, hyacinths and violets, reflecting the Ottoman passion for gardens and horticulture, combine with the long, curved, serrated “saz” leaves that are characteristic of Iznik ceramic design. Figural motifs featured birds, animals, ships, fantastical beasts such as dragons, and the occasional human figure. Abstract designs frequently included something called a çintimani, or chintamani, whose name comes from the Sanskrit for “lucky jewel.” Originally a cluster of three or four “flaming pearl” dots surrounded by wavy lines, the motif was later interpreted as leopard spots and tiger stripes signifying strength and courage. Another common motif was the breaking-waves pattern with its cluster of swirling dots. The stonepaste wasn’t well-suited for turning on a wheel so many of the pieces were shaped and pressed in molds. Decorative painting sometimes was done freehand but often involved the use of stencils, especially in the production of tiles with repeating patterns, such as the Iznik tiles that adorn the Süleymaniye Mosque, the Dome of the Rock and important sites in Turkey and throughout the Islamic world. Although the sultans were their most important customers, the potteries of Iznik produced wares for everyone. Dishes, bowls, bottles, vases, even beer tankards were made for household use. Lamps and ritual objects were destined for religious sites. Tiles were made for private homes and public spaces indoors and out. Many pieces were produced for export to European trading partners. 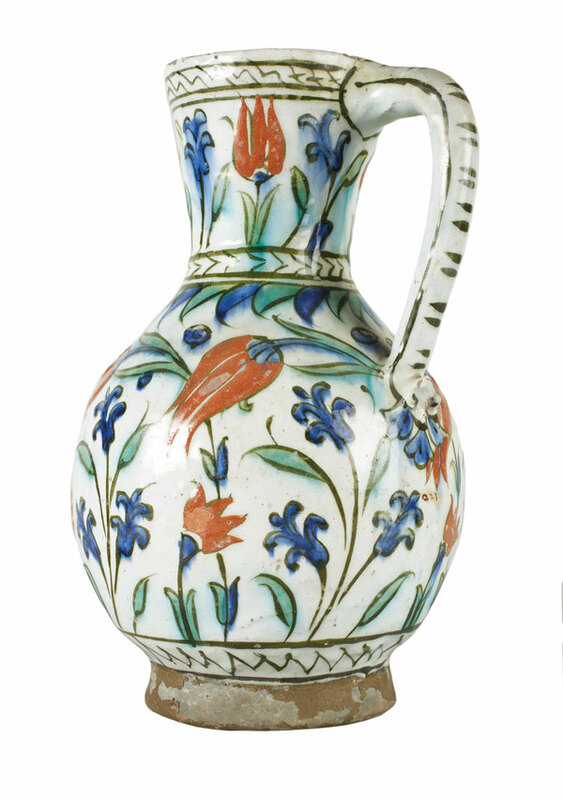 By the time production tailed off in the mid-17th century, Iznik ceramics were everywhere. They still are. You’ll find them in museum collections around the world, including some fine examples in the collection of the Princeton University Art Museum and the Metropolitan Museum of Art in New York City. The fact that many of the objects we see today show signs of wear is partly due to their age and partly due to the fact they were made to be used. When they were not in use, they were kept out on display. Their beauty is probably what the sultans appreciated about Iznik ceramics most, and why we still appreciate them today. Leslie Gilbert Elman is the author of Weird But True: 200 Astounding, Outrageous and Totally Off the Wall Facts.